Our research focuses on the control of the polarization state of light with the use of nanostructured materials, in particular with plasmonic resonators. Our activities cover all the aspects of the control of the polarization, from samples fabrication to polarimetric characterizations and modelling. From the fundamental point of view, we are describing the relation between the symmetries of the plasmonic modes excited in metallic nanostructures or the coupling among the nanostructures and the polarization state of the radiated light, with emphasis on creating circular polarization. From an applied physics point of view, we are investigating the use of circular polarization for the detection of biomolecules for medical applications as well as for the design of covert images for anticounterfeit tags. Low cost, small footprint detector for fast and sensitive screening of biomolecules with enantiomer sensitivity would greatly benefit from the engineering of the polarization state of the electromagnetic fields at the nanoscale. 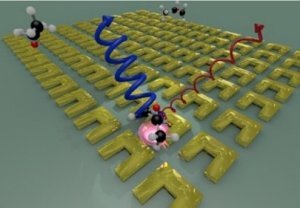 We are developing new sensitive surfaces based on functionalized plasmonic resonators exhibiting magneto-electric coupling. Our work covers numerical investigations, sample realization and polarimetric detection of the presence of biomolecules. The possibility to covert images in the polarization state of light relies on the realization of highly anisotropic photonic resonators. 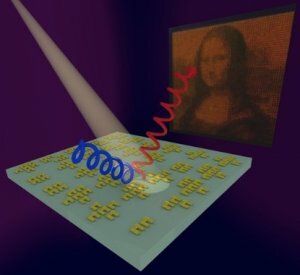 We are developing surfaces with spatial control on the polarization state of light, with emphasis on circular polarization, to design pixels that would reveal images only in particular observation conditions. Our activities cover the design of independent pixels, the realization of images encoded in the spatial control of photonic resonators and the observation of covert images.